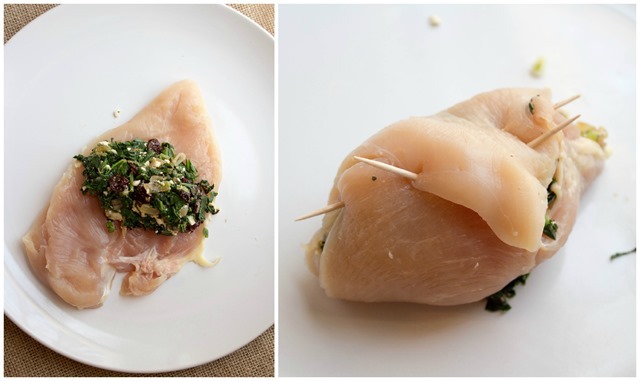 Guys, I am PUMPED about this stuffed chicken recipe. It’s easy to make, healthy but absolutely delicious, and “fancy” looking enough to enjoy when guests are over, too. Total win in my book! 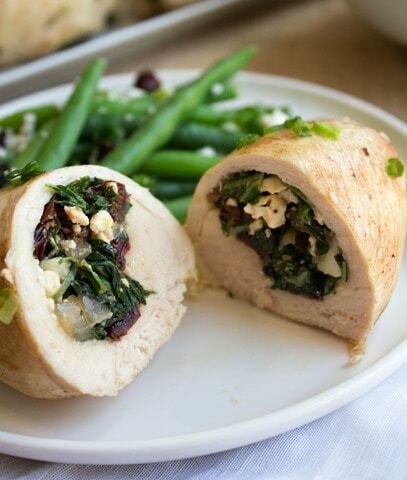 Introducing: Tart Cherry, Kale and Feta Stuffed Chicken. As you guys know, I’m a huge tart cherry fan, and this recipe is the latest creation for my partnership with the Cherry Marketing Institute. Not only are tart cherries packed with anthocyanins, which help fight inflammation (making them great for athletes), but I have a new fun fact for you guys: they also contain melatonin! Interesting, right? This means that they also might help to increase your overall sleep efficiency, aka the quality of your sleep: the amount of time you spend actually sleeping vs. tossing and turning. 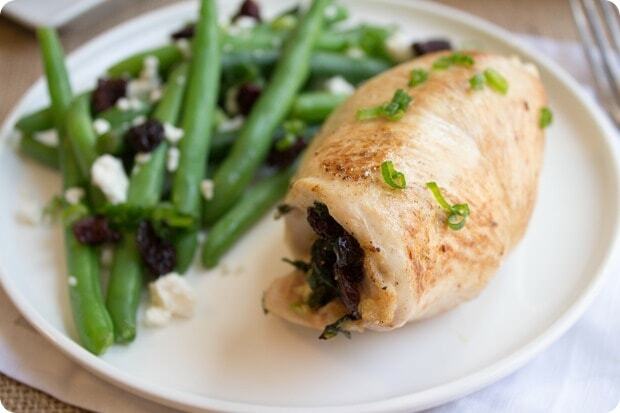 Stuffed chicken is always something I thought was more complicated than it apparently actually is. 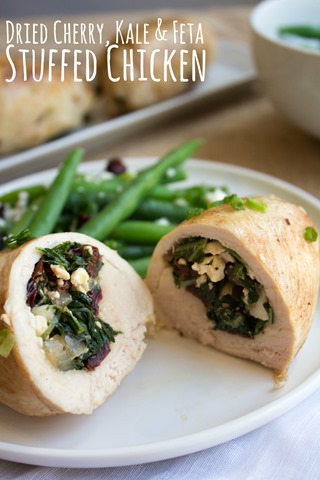 Sweet and savory at the same time, this stuffed chicken would make a great fast weeknight meal, or, like I mentioned, a nice meal to impress guests with! I whipped it up this past weekend for some family and everyone gave it two big thumbs up. Feel free to pair it with whatever you like – you guys know I really love string beans, but any veggie or salad will do. Some rice or sweet potato would be good on the side, too, depending how hungry you are. Making this recipe is easy. The only thing you need to make sure you have on hand that you might not already is some toothpicks, to hold the chicken around the stuffing! If you’re not an onion fan, you can also feel free to make this without the onions – up to you. First up: sauté the onion (the regular one, not the green onion yet) in olive oil (virgin or extra light, remember?) for a few minutes until softened and browned. Then, you add in the kale and dried tart cherries, and once the kale is softened, remove it all to a bowl and allow to cool a bit. 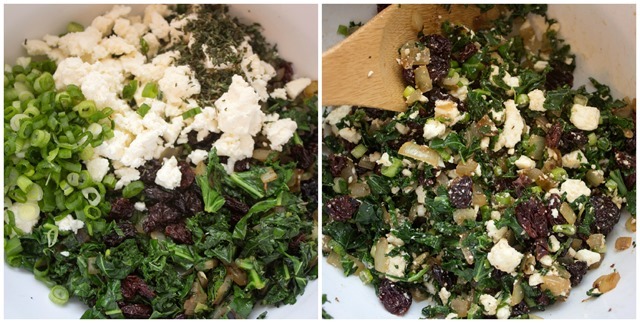 Once the mixture is nearly cool, add in your feta, thyme, and green onion, plus a little salt and pepper to taste. Then you are ready to stuff the chicken! This would also work with another meat, like pork tenderloin. I’m going to try that next time! Then, you cook! Sear the chicken first in a pan so the both sides are nicely browned. And then pop it in the oven! If you are using an oven safe pan, you can just put the whole pan in the oven; if not, just move the chicken to a baking pan. 15 minutes later, and it’s ready! This bright and flavorful stuffed chicken pairs juicy tart cherries with savory onions, kale, and feta. 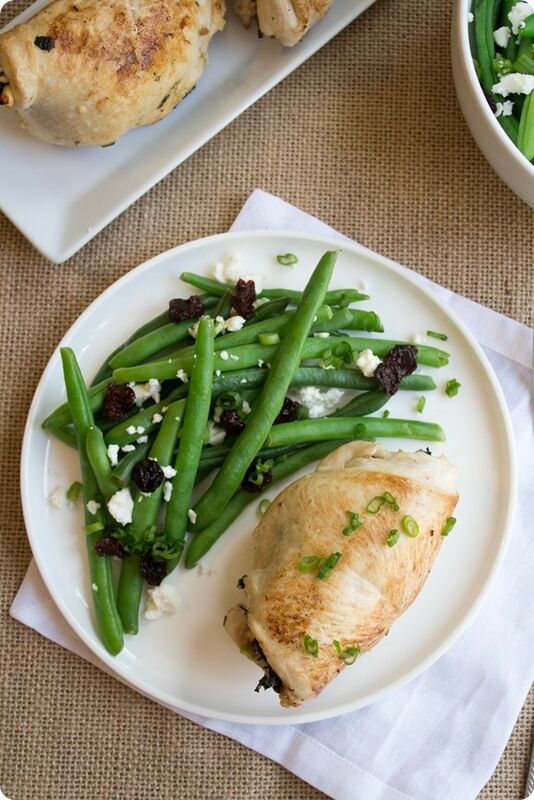 Easy to make, but still a great dinner to impress guests! Heat a drizzle of olive oil in a large pan over medium high heat. Add the onion and cook for 4-5 minutes, until softened and lightly browned. Add the kale and dried tart cherries and cook until the kale is wilted. Place in a bowl and allow to cool slightly. 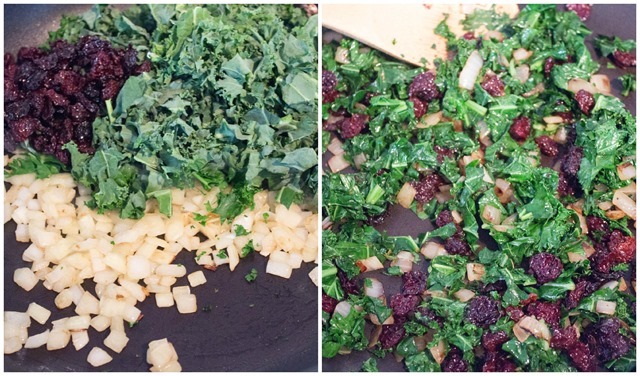 Add the feta, thyme, and green onion to the kale/tart cherry mixture. Season to taste with salt and pepper. Place 1/4 of the filling in in the center of a chicken cutlet. 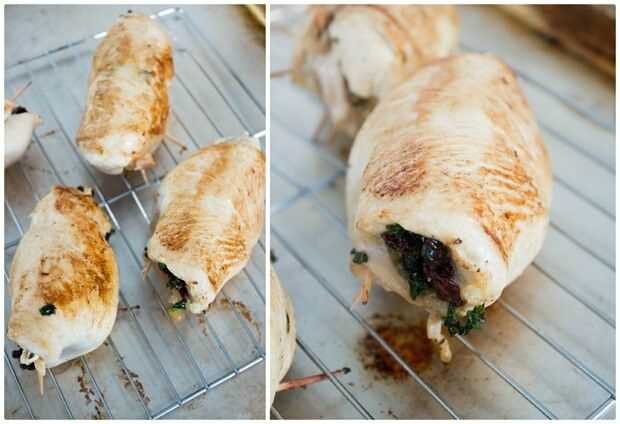 Roll the chicken around the filling and secure with toothpicks. Repeat with the remaining chicken and all the filling. Heat a large pan over high heat with another drizzle of olive oil. Add the chicken and sear until lightly browned on all sides. 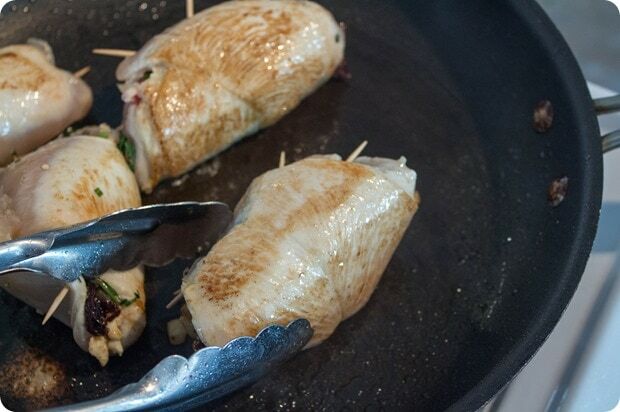 If using an oven-safe pan, place the entire pan with the chicken in it into the oven, then bake for 15 minutes, or until chicken is cooked through. If your pan isn't oven-safe, move the chicken to a baking sheet instead. Looking for more tart cherry awesomeness? Check out my Tart Cherry Pie Snack Balls! Thank you to the Cherry Marketing Institute for sponsoring this post! Omg these look so yummy! Thanks for sharing! I need to try making these! Those look great! I love tart cherries (especially covered in chocolate haha). Looks delicious! I love the addition of the cherries. These look amazing! I think the tart cherry and feta cheese would go well together. 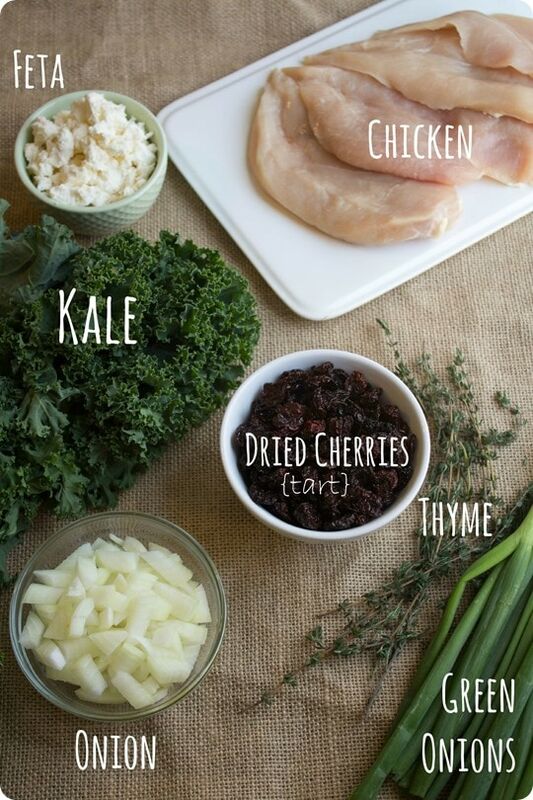 Never would have thought to add cherries! I bet this is delicious. Pinned! I have to say..the chicken is beautiful! This looks absolutely fantastic! 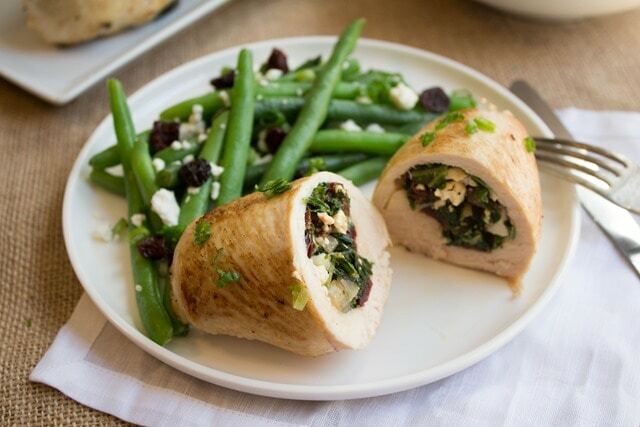 I feel like I’ve gotten away from stuffed chicken recipes for a while (and I feel like all I ever stuff them with is cheese), but this looks like it would be an amazing recipe for the spring/summer months. I feel like you could even grind up all of the ingredients for a great marinade to grill the chicken in as well. oh my goodness – this looks great!! all of my favorite things LITERALLY rolled into one!